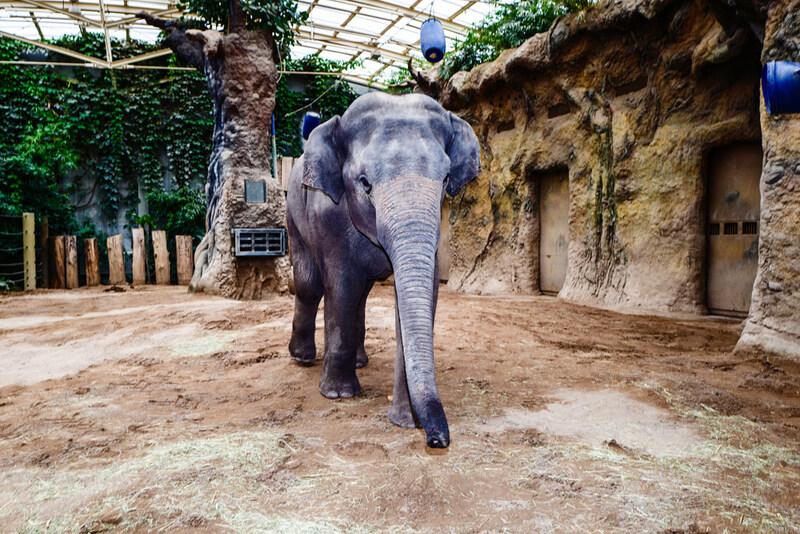 Whether elephants catch a cold, what operative matriarchy does to young men, and why Ghandi was once a “terrorist” – it is astonishing what you can learn when you are on local safari in the Zoo in Heidelberg. 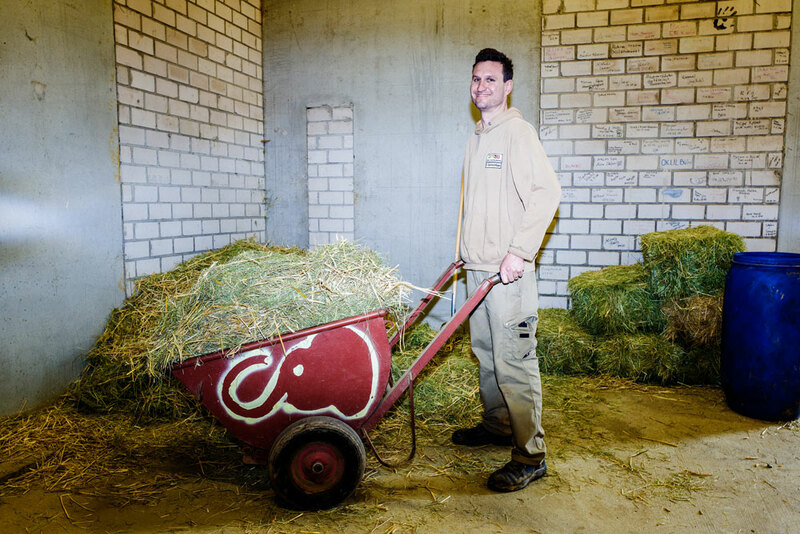 Animal keepers Tobias Kremer and Stefan Geretschläger run a young bulls’ living community – the only one of its kind in Germany. His and his colleague’s educational style could be described as decidedly elephant-empathetic. Their living community for young bulls, which was founded in 2010 and at the moment consists of four elephants, has been established according to latest animal-pedagogical knowledge. 2.43 m shoulder height and already an impressive trunk: Gandhi used to be a Danish hooligan, but today he is a really nice guy, and the boss of the young bulls’ living community. 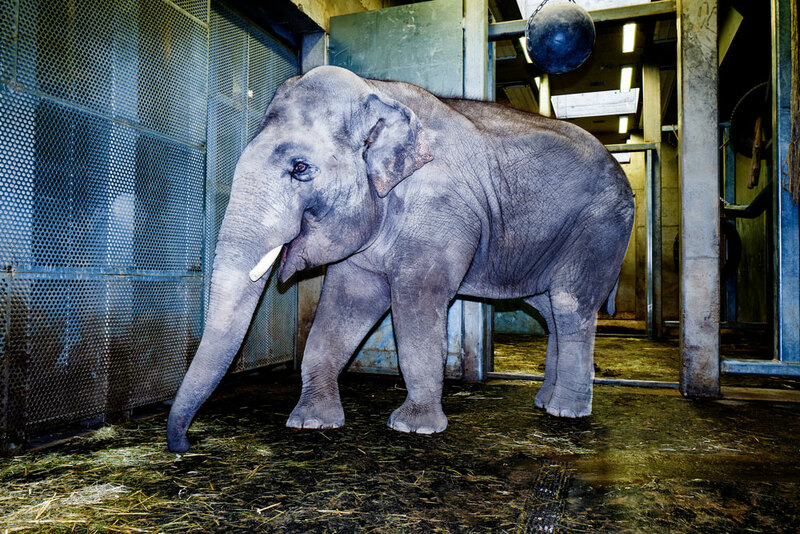 The concern that working with animals of such enormous elephantine power could prove horribly dangerous is astonishingly quickly dissipated: There is no direct contact between elephant and animal keeper. How can that be? A fascinating multi-function wall ensures the keepers’ safety in cases of clumsiness or sudden anger eruptions of the enormous animals. Yet it is not merely a safety barrier. 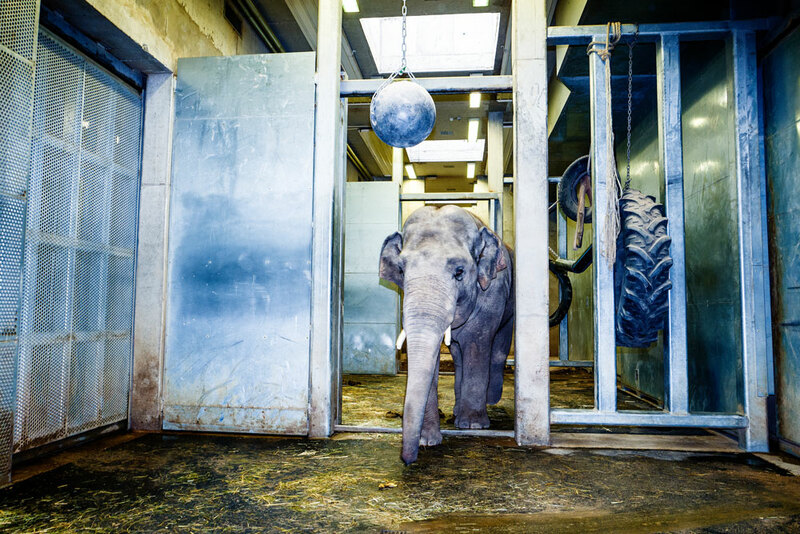 The two animal attendants came up with the idea of this device themselves and they are convinced: “There is no better training wall,” since they can open up all sorts of doors with it for the young bulls Gandhi, Ludwig, Yadanar and Tarak. 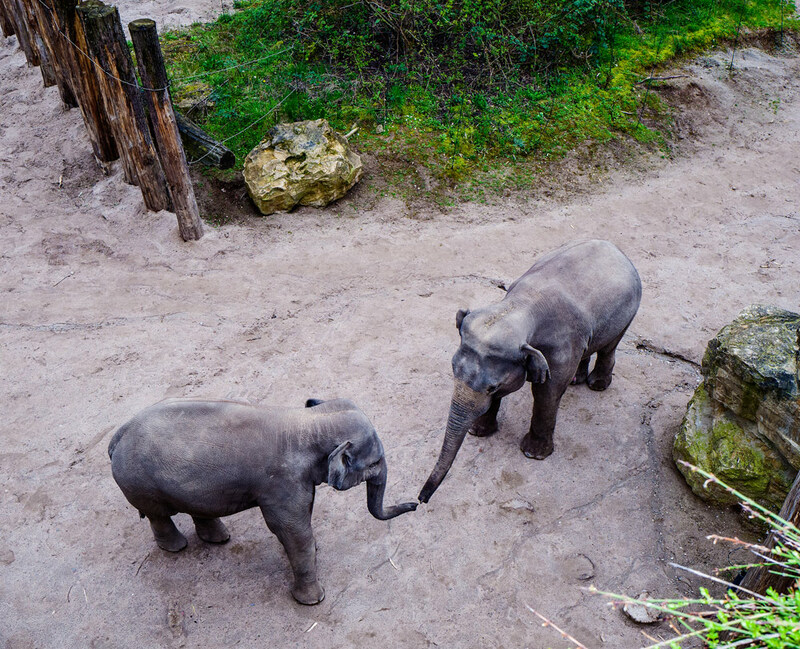 The elephants then show their trunks, feet or ears and thus playfully train for medical controls. 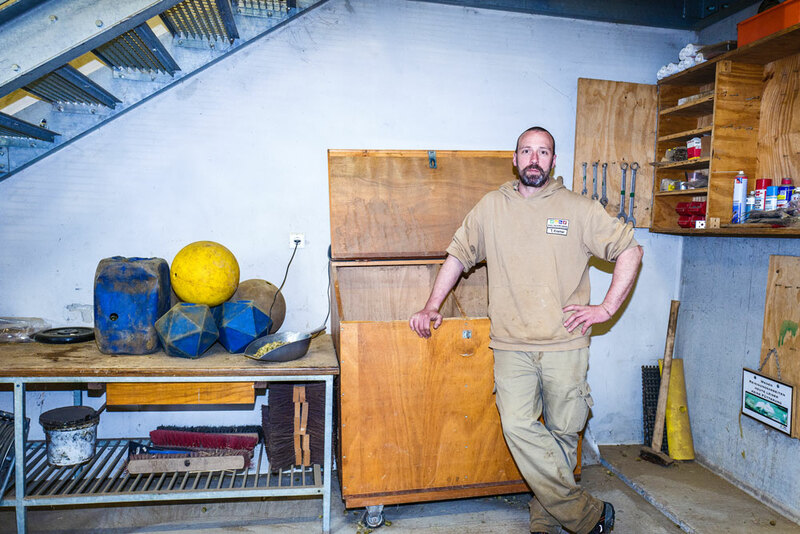 A metalworking manufacturer in Mannheim constructed the bulky device: 15 tons impact load should do the trick and somewhat calm a bull when the ten-year-old boss comes round the corner: Gandhi, 2.43 meters shoulder height, impressive trunk. With which he can even play the blues-harp – like a hard rocker, that is. A guy for whose pedicure a file is not used but instead a grinding machine. “That is gentler.” Yes, indeed! 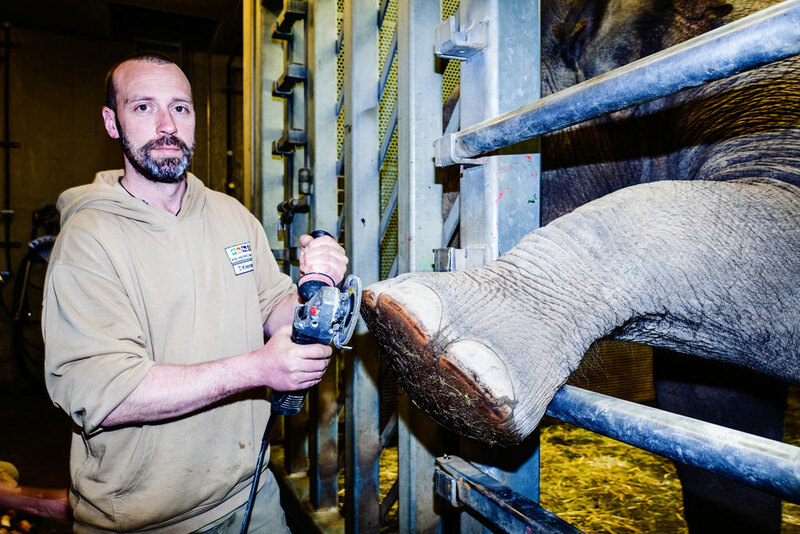 The gentle touch: Tobias Kremer pedicuring the elephants with the grinding machine. Ghandi used to be a Danish hooligan with slightly terrorist tendencies. Now he is a true pal. 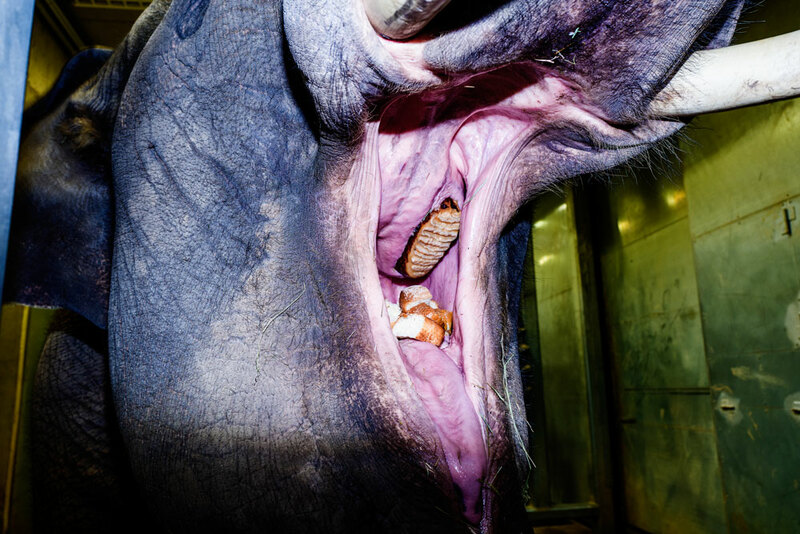 This is why hay and straw are not just lovelessly thrown onto the floor but hanging in bins from the ceiling so that the pachyderm-gourmets have something to tear at. This means that the term “elephant enclosure” is only a very insufficient description of what the gang of young bulls is being offered. It is in fact a near-nature recreational park endowed with swimming pool (“swimming makes them tired”) and sand basin (“to throw over the back”) and a gigantic strangler fig tree (“to rub against”). Just follow your trunk: Ghandi (at the back for once) and Tarak (front) at the outdoor terrain of the elephants’ living community. 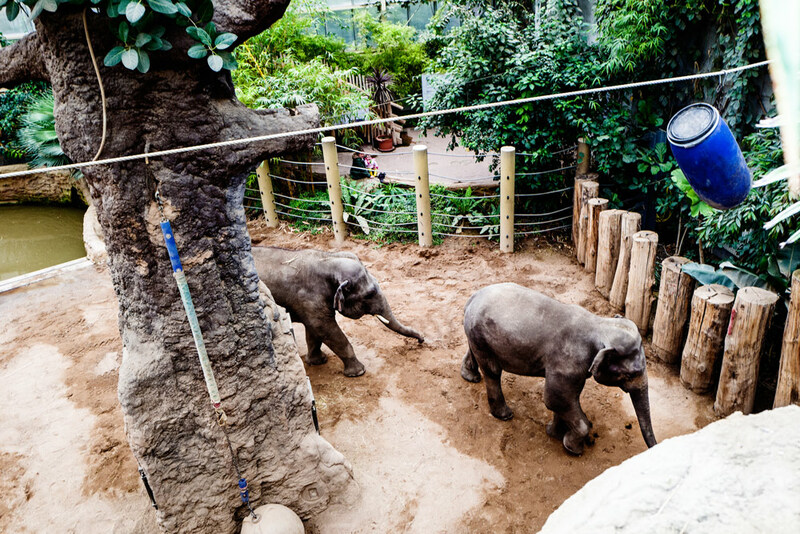 The indoor area as well as the inestimably vast outdoor terrain were created to share a close resemblance to a Southeast Asian river landscape where Asian elephants are at home. This has no longer anything to do with the dungeons surrounded by trenches one might recollect from one’s own zoo excursions in childhood days. Dull back and forth swinging for sheer life-weariness is not what you will see here in this Garden of Eden. So, Gandhi came from Denmark to Heidelberg. “At the beginning, he was at times very aggressive in his new surroundings, quite the hooligan; you might say even a terrorist.” Patient training transformed him into a really good fellow, even if one thing is very clear: Gandhi is the boss around here – and nobody else. The training programme in Heidelberg is exclusively based on rewards. With the help of a “target”, a bamboo stick, the keeper indicates what has to follow after the command. “Lay down!” is one such command. 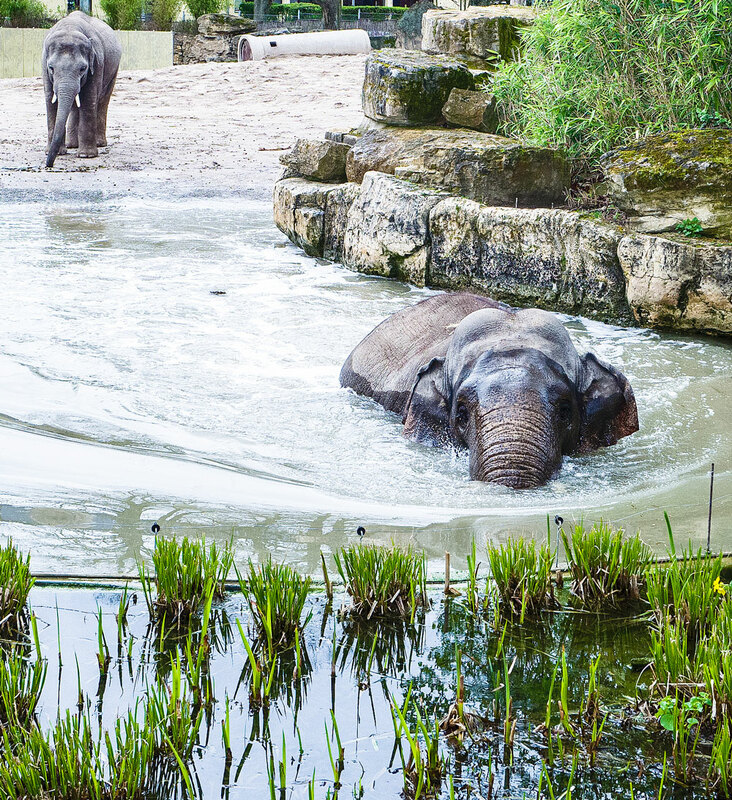 When the colossus lies down, this is a great sign of the elephant’s trust. Although he is one year older than the leader of the group, enclosure-mate Tarak is more like the wimp of the group. Typical artist, you might say. But he, too, learns. “Development of confidence,” is one of the major learning contents. This is also true for the two younger ones, Kim Yadanar Min (6) and Ludwig (5). The latter is from Munich and loves his pretzels like any true Bavarian. Anyway, without bread any didactic process would be unthinkable: This is what the elephants are rewarded with, this is what the grey giants would do almost anything for. They call this success by means of food rewards. The daily bread: the favourite food of the young bulls from Heidelberg. In order to understand why such an effort is being made with these four young elephants you have to know that the development takes a different turn in the wild: The little boys grow up with mummy, aunts, sisters. In puberty they start to fight and are sent away to wander around in the wild, where they meet other young bulls and found something like rambling clubs. And this is exactly what the living community in Heidelberg simulates. The aim of it is to eventually become a cool enough guy to impress the girls of another herd. 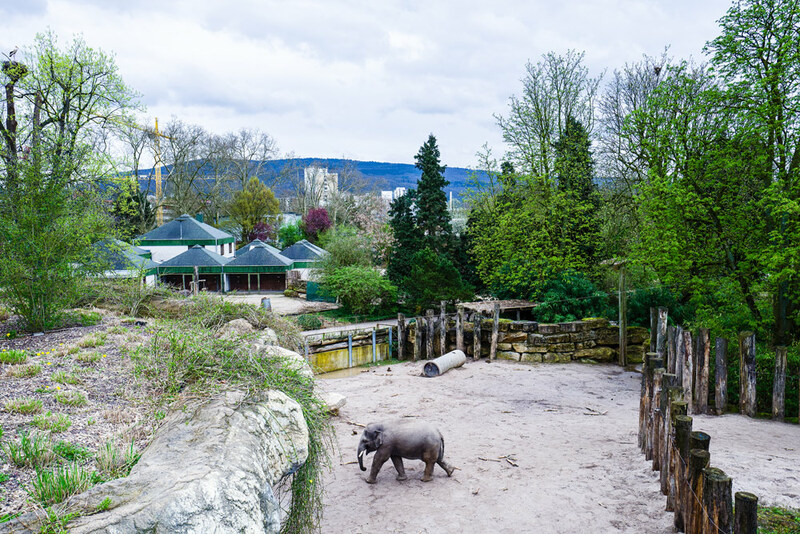 “We cooperate with many zoos in Europe. At the age of about 15 such a bull goes on his journey and then eventually starts a family of his own somewhere else.” This concept is part of the whole package of captive breeding which is necessary since the natural habitats are extremely shrinking. Until they move out, Ludwig, Yadanar, Tarak and Gandhi still have enough time to enjoy Heidelberg with all their senses. Their living community should make even skeptics happy who otherwise do not especially like zoos. And when you observe the two keepers carrying out their work, you would really love to cast them for an adventure film where they would save elephants, catch poachers and capture the hearts of the female audience – they could surely do all that.